Once again, I wanted something light, romantic and hopefully funny. I was really keeping my fingers crossed for that latter one since my last attempt at a humorous read failed horribly. Hi, Magical Mystery Paws.. Did this novel succeed at fulfilling my needs? Why yes. Yes, it did. I was actually pretty blown away by Teri Wilson’s writing! 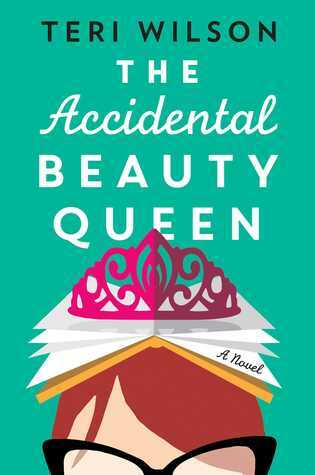 The story is told by Charlotte, the nerdy twin, who takes her sister’s place in a beauty pageant after an unfortunate mishap. This actually makes for a very interesting point of view since we get the perspective of a person used to knowing about pageants, but not being an actual part of it until now. Sure, there are some occasions where the importance of looks is mentioned, but the author also challenges this. Loved it! I prefer the scent of ink on paper and old library books to perfume. Then we have Charlotte’s unique voice. Like I said, she’s the nerdy twin. A librarian who lives for books, loves books, breathes books and has a whole lot of shirts with literary quotes on them. Should I even mention all the Harry Potter references? Because there are a lot and I loved them all! You could safely say she stole my heart right from the start. That’s not even mentioning the growth she accomplishes as a character! I really admired her and the way she started seeing things differently, opening up to a world she always ignored, started accepting truths about herself and her past. All this combined made for a beautiful evolution of both her character and the relationship with her twin sister – which is definitely an important thing to mention as well! Why? Well, because there’s a very clear focus on their relationship throughout the entire story. They have a past, there are secrets between the twin sisters and those are waiting to make an appearance. It adds so much to this story and makes it more than “just a love story”. It really is more than a romantic novel, people. The other character I truly loved? Well, the love interest of course! He uses literary quotes quite a few times and, as Charlotte, I just felt my heartbeat speed up. Not even ashamed of it. Because the world is a shallow place and all anyone cares about is appearances. The only thing I wish was a bit different, is the evolution in their initial attraction towards one another. It’s there, and you can feel it.. But I wish it would’ve had more obvious progression instead of jumping from one thing to the next? Could be me looking back at my reading experience though, since it didn’t really bother me at the time of reading! This simply was the perfect read at the perfect time for me – which made me enjoy it so, so much! Although it isn’t a new favorite, it definitely brightened my day and gave me exactly what I was craving. I loved all the literary quotes, the romantic aspect and the relationship between the twins! What are some light, fluffy reads you adored in the past? Do you sometimes have a hard time finding a read that fits your mood? All quotes are taken from an uncorrected proof and might differ from the finished copy.